Andrew Gillum’s loss in the Florida governorship seems to be extremely rough on all the talking heads at MSNBC. From the very start, Mr. Gillum was everything that MSNBC could have wished for in a candidate. 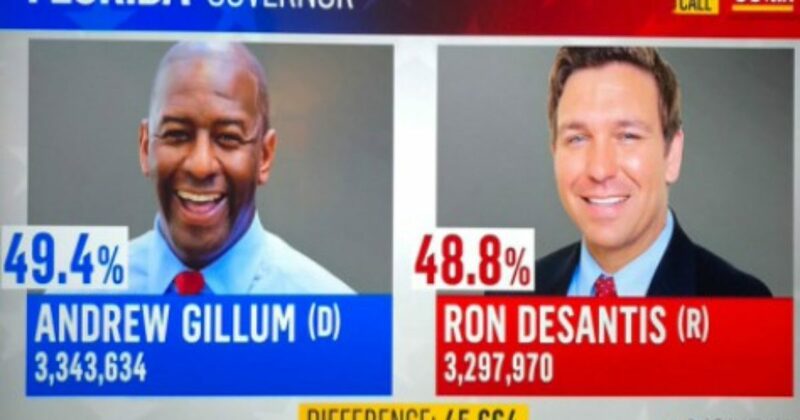 Probably the most embarrassing blunder that the liberal network made was the graphic that they put up that had Fake Election Results showing Gillum in the lead. It was an impossible report because of the fact that voting was still in progress and no votes had yet been counted. It did show the mindset of those behind the scenes. Be sure and see the graphic in the article. The most hilarious coverage of the midterms was MSNBC’s handling of Andrew Gillum’s losing campaign for Florida’s governorship. The 90% of the media that hates Trump and his supporters really, really wanted Andrew Gillum to win: he’s a radical leftist who is charismatic, articulate, and very left wing. Oh, and he is black, which means he has the potential to drive black turnout to Obama-like levels. “Quick clarification here,” a rather embarrassed All In host Chris Hayes told viewers. “Just want to say, earlier this hour, uh, we showed a graphic of the Florida gubernatorial race. May have caught your eye because our system had inadvertently populated some test numbers. Obviously, we do not yet have any vote totals here, the night before the election. That was a misfire. Don’t worry. I was pretty confused when I …….